Town officials and the Royal River Conservation Trust hope to raise $45,000 in private donations to complete the $310,000 project by year's end. Paddlers on an L.L. 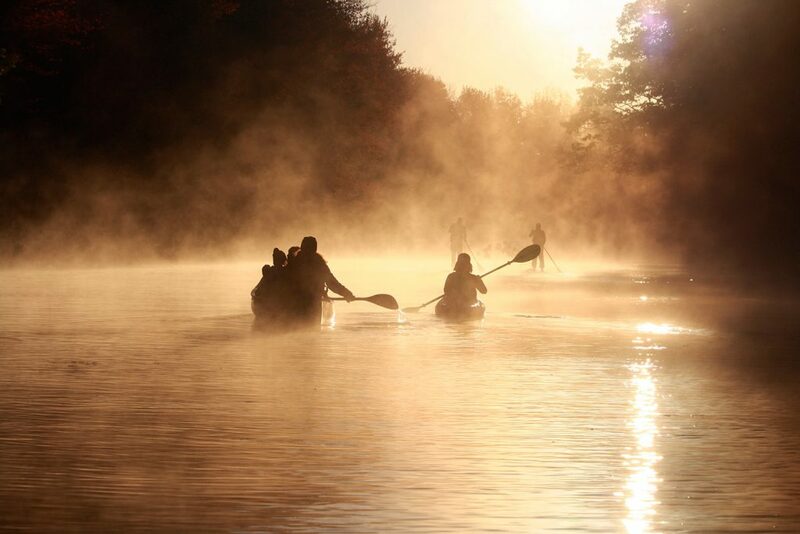 Bean outing in mid-October head out on the Royal River at sunrise at the Yarmouth Riverfront Woods Preserve. The river is a popular destination for flat-water paddlers three seasons of the year, and for skaters, snowmobilers and others in the winter. The town of Yarmouth and a local conservation group are making a final push to preserve a 24-acre tract of undeveloped shoreline along the Royal River that is heavily used by paddlers and skaters. The Land for Maine’s Future program voted to award $110,000 last week to the Yarmouth Riverfront Woods Preserve, which features 700 feet of shoreline plus 24 acres of woodlands and wetlands about a mile upriver from the downtown boat launch. The LMF board vote came six months after the Yarmouth Town Council unanimously agreed to allocate up to $110,000 in municipal funds toward conserving a parcel that abuts two other town-owned preserves along the Royal River that total more than 57 acres. Now, Yarmouth officials and the Royal River Conservation Trust are hoping to raise the remaining $45,000 – on top of $45,000 in private donations already pledged – to complete the $310,000 project by year’s end. 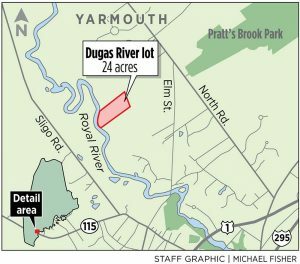 Alan Stearns, executive director of the trust, said the so-called Dugas property is one of the only remaining undeveloped stretches of the Royal River between Yarmouth and North Yarmouth that is not yet protected from development. “That stretch still has herons and deer and beaver and coyotes, and that is part of what makes the paddling and skating experience so exciting because you are paddling through some genuinely remarkable habitat,” Stearns said Wednesday. Located roughly 20 minutes from downtown Portland, the Royal River is a popular destination for flat-water paddlers three seasons of the year as well as for skaters, snowmobilers and others during winter. L.L. Bean regularly uses the river in Yarmouth for kayaking, canoeing and paddleboarding lessons or programs offered through Outdoor Discovery School based just a few miles up Route 1 in Freeport. Dams on the lower Royal River in Yarmouth once supported large mills but now create a roughly 6-mile stretch of flat water between Yarmouth and North Yarmouth that draws local residents and others from the Greater Portland area. Although there has been a robust debate for years about whether to remove the two lower dams, town officials have shelved those discussions amid concerns over impacts to the popular flat-water section and potential contaminants in sediments behind the dams. The Yarmouth Riverfront Woods Preserve was one of 15 projects slated to receive a slice of $3.2 million in funding that the Land for Maine’s Future board allocated last week. It was the first LMF funding competition in three years, with 26 projects statewide submitting applications totaling roughly $7 million from the popular, state-run conservation program. The land trust and Yarmouth officials touted the Yarmouth Riverfront Woods Preserve as a “shovel-ready” project because the town had already agreed to earmark $110,000 to the acquisition. When combined with existing town-owned preserves, the Riverfront Woods Preserve would create an “81-acre natural corridor with over one-half mile of the Royal River running through its center.” One of the parcels already owned by the town, the 22-acre Hilda Barker Preserve, abuts the proposed Riverfront Woods Preserve but lacks a dedicated public access point. The other existing preserve is the 35-acre Sligo Road Preserve, located across the river. The current property owners, the Dugas family, have agreed to sell the property to the town for $135,000 less than the appraised value. At the same time, the family is seeking town authorization to build a subdivision on land located between the 24-acre Riverfront Woods Preserve parcel and East Elm Street. While town officials insist the preserve proposal and the subdivision are separate and independent transactions, the Dugas family has agreed to build a public road, parking lot and trails to access the adjacent Barker preserve and the Riverfront Woods Preserve. The $110,000 in town funds will come from a land acquisition reserve account created by Yarmouth officials several decades ago for special projects such as this, Tupper said Wednesday. While the expenditure will deplete the reserve account for now, Tupper said, Yarmouth leaders wanted to seize the opportunity to preserve riverfront land that could be subdivided.